Have you ever had a ‘oh wow’ moment with your genealogy? I’ve had more than a few in the last few years. If you do enough digging, you will find something interesting. Some have been detailed on this blog. Other’s would make some ‘clutch their pearls’ and aren’t suitable for the internet. I *think* I’m having another. The 1910 United States Census finds 70-year-old Michael Lowry Sr. and his wife Margaret living in Leetonia, Ohio. Margaret and Michael have been married for 20 years according to the Census sheet and lived on a farm on Washington Street. Now, here’s where the intrigue rests: Ten years prior, in the 1900 Census, Michael’s wife is listed not as Margaret but as Bridget. How can be married 20 years but just 10 years prior was living with someone else? Do I have the same Michael Lowry? I suppose it’s possible (but rather doubtful) that there are there two elderly Michael Lowrys living in a town of 2,600 people. That said, only one is easily found in a search of the 1900 and 1910 census records for Leetonia. I know Bridget Conley Lowry died in 1904; her obituary is available here and here on the blog. You will notice her obituary makes no mention of Michael. I will accept that Michael remarried Margaret, but when did they marry? Does that mean Michael divorced Bridget? Or where Margaret and Michael not married 20 years, but only married after Bridget’s death? All this family drama may help explain the court battle that Michael and his daughter Margaret Lowry Lanaghan were fighting. All I’m certain of is that Michael had two wives. When he was married to each remains to be discovered and means two things: first, there are going to be more blog posts in the near future. Second, I need to make a trip to the courthouse in Lisbon and get answers to all these questions I just asked. ” Margaret, wife (ref)#2, female, white, 60 years old, 2nd marriage, married 20 years. No child born. Number of children living is zero. Born in Ireland. Father born in Ireland. Mother born in Ireland. Immigrated in 1880. Speaks English. Not employed. Can read: Yes. Can write: Yes. (#1) The 1910 Farm Schedule was a separate census schedule that would have provided additional information about all farms, but was destroyed before 1922 as either part of a fire or a ‘slimming’ of Executive Branch documents; it’s unclear. (#2) (ref) was written on the census sheet to indicate who answered the enumerator’s questions. 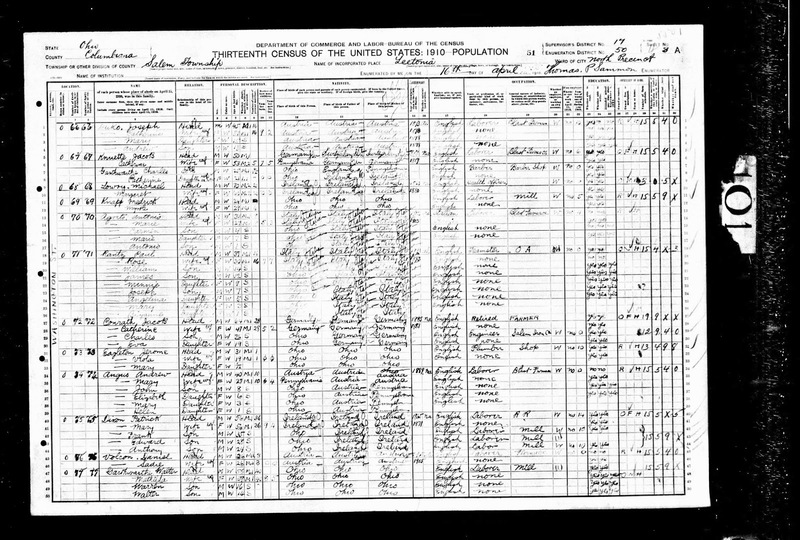 1910 U.S. Federal Census, Columbiana County, Leetonia, population schedule, Enumeration District 50, Sheet 3A, Dwelling 68,. Michael Lowry; digital image, Ancestry.com (http://www.ancestry.com : accessed 17 February 2014): FHL microfilm: 1375175. National Archives microfilm publication Roll T624_1162.